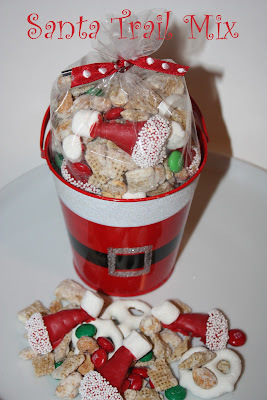 I saw the idea for making this trail mix last year via Craft Gossip. It's so cute. I died. Then I asked my dog to resusitate me, and I got to work. The original link is here. We made this for the office last year. Heather had these super cute pails from the Target Dollar spot (I've seen people make pails like this, but it was certainly easier to buy). I actually anticipated this would be a lot more difficult that it actually was! Before I made the hats, I took pretzels, chex, and nuts, and drizzled the top with melted chocolate, and then toss them to coat. I added M&M's, and then I went to work on the Santa hats. The original site suggested using a bugel that already had a coating so they are sturdier. I grabbed caramel bugels, white sprinkles, marshmallows, and red melting chocolate. I melted the red chocolate 40 seconds at time, stirring, and then heating until it was runny. I then popped the bugels it, and tapped the excess chocolate off with a fork. I sent my chocolate coated bugels on wax paper, and pressed a marshmallow to the top. When the hats dried, I redipped the bigger end in the chocolate (I had to reheat mine a little), and then I dipped the bottom in sprinkles. I let them dry, and then tossed them with the rest of my mix. I bagged them up, and called it a day. So stinkin' cute I can't stand it. I bookmarked these last year too but never got around to making them. I need to get on it! Love the santa hats. My son would love to make this for the family for christmas... So cute. These are incredible! So love them. So on our list of things to do this year! Pinning this so I don't forget! LOVE!!! I just made Thanksgiving Blessing Mix with my boys today and have saved this entry so we can make it in December. Perfect for my son's doctors, therapists, and our movie and snack boxes we make for their little friends. So cute! This is such a cute idea with the little hats! I love the pail idea and would love to make them this year. If you wouldn't mind sharing how you made them I would be truly grateful.